What says summer more than camping?! The season is not complete without at least one trip out to sleep under the stars, to cook your meals outdoors and to enjoy the s’mores around the bonfire. 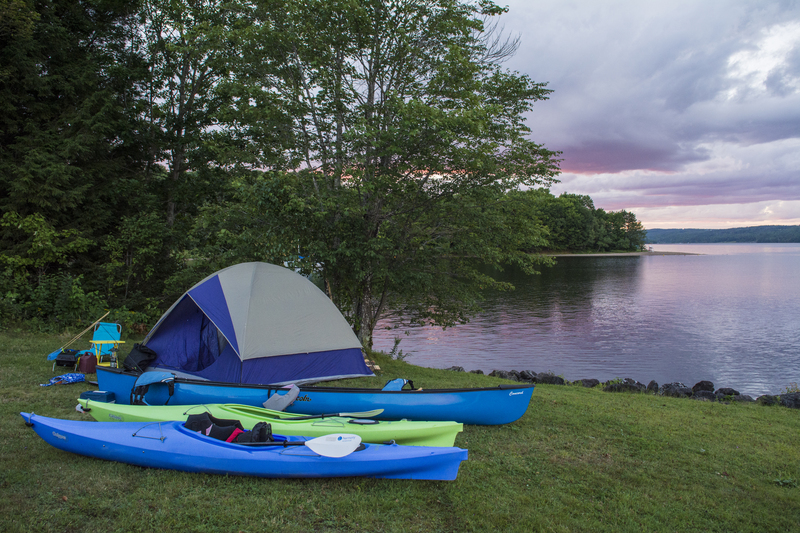 All 6 of the Fredericton camping destinations listed here take full advantage of the fantastic Saint John River so you can’t go wrong when it comes to scenery. #1 – Great Bear Camping (44KM from Fredericton) is where I camped with my brother Dennis and nephew Isaac just a couple weeks ago. Hospitality was great right from the start as we were taken by golf cart to view each of the 3 available sites to help make the choice. We went with the site in closest proximity to both the pool and the washroom/shower building. My nephew Isaac was more than satisfied with the onsite offerings of salt water swimming pool, fishing, teeter-totter, swings and the resident groundhogs. The campground has many seasonal campers who have made their homes-away-from-home with built on decks, screened in porches, flower beds and more. There was a definite sense of community among the obvious long-term residents as they regularly stopped to chat with their neighbours while out walking their dogs (very pet friendly place!). We took time to do some exploring in the area and didn’t have to travel far to enjoy a walk at the Hawkshaw cable-stayed suspension bridge, a visit to the World’s Largest Axe in Nackawic and short hike to Howland Falls. An element I enjoy about the ‘outdoor living’ is how you inevitably get to know a little bit about the people around you. Our Friday night campsite neighbours were a large family from Vermont who appeared very well prepared for their outdoor adventure. They set up and tore down their 2 large tents with great expertise. Saturday night’s neighbours were a couple from Fredericton who camp there at least one weekend every summer because they really enjoy the pool & the fishing and really appreciate the hospitality. We enjoyed our stay at the Great Bear and have already started planning a return visit. #2 – Mactaquac Provincial Park (25KM from Fredericton) offers all the perks of a provincial park including an 18-hole championship golf course, hiking trails, a great beach, restaurant, store, 300+ campsites and more! #3 – Woolastook Park (28KM from Fredericton) boasts a ton of acreage, beautiful tree lots, wooden tent rentals, wildlife, beach area, day park, miles of biking and hiking trails, a 9 hole pitch and putt, kayaks, canoes, bikes, volleyball, horseshoe pits and beautiful views of the Saintt John River. #4 – Hartt Island RV Resort Water Park (within Fredericton’s city limits) on the banks of the Saint John River has lots to offer including a heated leisure pool, water slides for all ages, mini golf and river adventures including canoeing, kayak and paddle board rentals. #5 - Heritage Country Camping (38KM from Fredericton) with 108 spacious sites offers swimming pool, horseshoes, volleyball, hiking trails and a large Rec Barn featuring dart tournaments, karaoke, potlucks, and kids’ activities. Home for the night, Heritage Country Campground in Queensbury, New Brunswick. #6 – Casey’s Campground (33KM from Fredericton) is a full-service campground with an on-site nostalgia museum and views of the Saint John River. Located down the road from Moxon’s Country Pumpkin and Harvey’s Big Potato, it’s the perfect location for some family fun! So dig out your tents, pack up your basics (don’t forget the bug spray) and go sleep outside! Summer is not over and you still have time! These are not likely the only camping options in the area, please leave us a message in the comments to let us know your favourite places to go camping.